Okay, and it’s not actually macaroni, either, but I love the way radiatorre holds the sauce. The principle is still there, and it tastes damn fine. 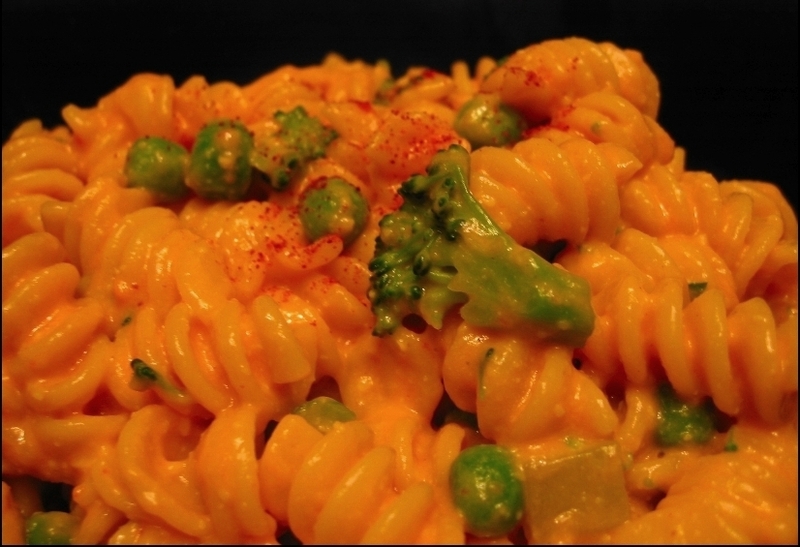 One of the first things I cooked for myself as a young’un was Kraft Macaroni & Cheese, and it was one of those comfort foods that I really missed as a vegan. This stuff has the same feeling for me, but tastes so much better! And, though I often forget, it’s not even unhealthy. It might even be good for me. This is adapted from an uncredited recipe that was posted in the VeganCooking LiveJournal Community, and I was unable to track down the original author. It was certainly similar to some recipes I’ve seen in books, so it could be anyone. If you’re out there, thank you! The original called for a jar of pimentos but I have since discovered that roasted red peppers work just as well and are much cheaper. I buy them large jars then freeze into recipe-sizes portions. This dish is so quick to make that even though the first thing I do is put the water on to boil, everything else is ready by the time the pasta is drained. (Though that might not be true if I had an induction cooktop.) It’s a great last-minute dinner that is always a guest pleaser as well. Even though I’d recently acquired Vegan Cupcakes Take Over the World, I didn’t have it handy when I started baking so the body of these is standard “Wacky Cake”. By the time they were in the oven, I was able to ponder my frosting option and chose Peanut Buttercream, but I’d made a double batch of cupcakes and only a single of frosting so I didn’t have enough to pipe. I added the streaks of chocolate syrup and the peanuts for visual interest, since the frosting was a fairly bland color, and I also like when a garnish reflects what’s inside. 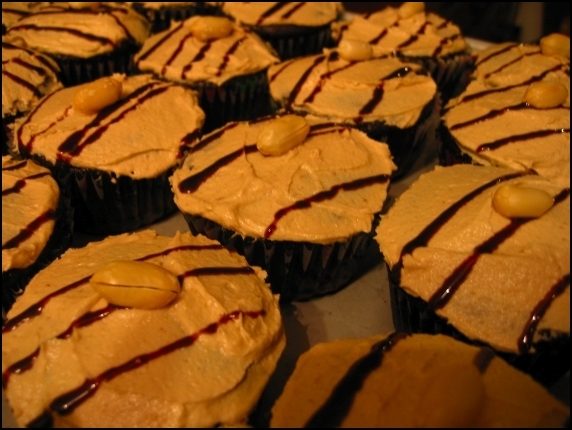 The cupcakes were delicious, and the peanut butter and chocolate definitely worked well together (to nobody’s surprise). Next time, I’ll do a lot more frosting and use it to fill the cakes.